Two late goals saw ten-man Worthing complete a remarkable comeback to secure a 4-3 win in an action-packed Sussex derby at the Pan, reports Tom Harper. Darren Freeman made one change to the side that won 1-0 at Wingate & Finchley in their previous game, with Ronnie Conlon returning from injury and replacing Nico Cotton in the starting line-up. The visitors saw plenty of the ball early on and were looking dangerous every time they went forward, with Alex Parsons going close twice in quick succession before Jesse Starkey just missed the target from the edge of the area at the end of an incisive counter-attack. Worthing scored the goal their start to the game deserved after 22 minutes, as a deep free-kick from the right led to a goalmouth scramble before Danny Barker eventually forced the ball over the line. Despite finding it difficult to enjoy any spells of possession throughout the first half, Lewes were level on 34 minutes through James Hammond, who swept a Steve Brinkhurst ball from the right past former Lewes keeper Lucas Cavagnari and into the bottom corner from the edge of the area. The Rooks were now in the ascendancy, and saw Omarr Lawson shoot just wide from 25 yards as they looked to build on their equaliser. Lewes took the lead one minute before the break, as Brinkhurst dispossessed Starkey deep inside the Worthing half, and Lawson ran onto the loose ball before crossing for Ronnie Conlon to finish from close range. The second half started in much the same way as the first, with Worthing seeing plenty of the ball as they looked to find a way back into the game. The visitors equalised just before the hour mark through Parsons, who was left unmarked at the far post to volley a James Crane cross from the left past Lewis Carey from close range. Lewes nearly regained their lead immediately though, with Cavagnari forced into a fine save to deny Dan Darbyshire at the end of a driving run through the middle. The game appeared to swing into Lewes' favour with just over 15 minutes remaining, as Worthing defender Barker was shown a second yellow card for a professional foul on Jonte Smith. The Rooks made their numerical advantage count straight away, as the resulting free-kick taken by Lawson was powerfully headed past Cavagnari by Tom Day to put Lewes back in front after 74 minutes. Despite being a man down and a goal behind, Worthing were still happy to control possession heading into the closing stages, but also seemed keen to test the Lewes defence by putting crosses into the area earlier. It was from one of these crosses that they equalised with four minutes remaining, as substitute Ollie Pearce sent a towering far-post header between Carey and the upright to level the scores. Things got even worse for Lewes in the final minute of stoppage time as Worthing won the game in almost identical circumstances, Pearce heading a deep cross from the right back across goal for unmarked substitute Joe Clarke to nod past Carey from close range and spark jubilant celebrations amongst the away fans behind the goal. 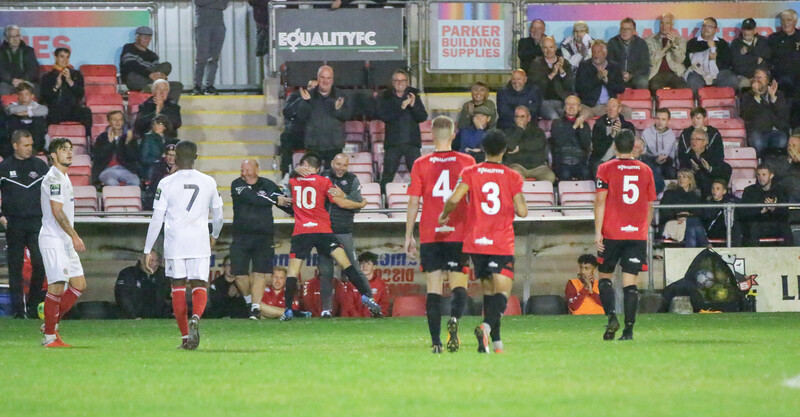 There was no time remaining for Lewes to muster a meaningful attempt on goal, and the Rooks were forced to reflect on a game they arguably should have held on to win, even after Worthing had controlled possession for long periods. After the game a disappointed Darren Freeman was quick to praise Worthing when he spoke to Barry Collins. Highlights from the game thanks to Your Instant Replay can be watched here. You can read last night's e-programme here. Lewes have a break from league action this weekend as they travel to National League South side Bath City in the FA Cup third qualifying round, kick-off at 3pm. Lewes: Carey, Dome-Bemwin, Redwood, Day, Chappell, Hammond (Reed 48), Brinkhurst, Darbyshire, Smith, Conlon (Elliott 83), Lawson. Unused Subs: Cotton, Karl, Medlock. Worthing: Cavagnari, Colbran, Crane, Budd, Parsons (Clarke 83), Barker, Ajiboye, Aguiar, Kealy (Miles 74), Newton, Starkey (Pearce 68).